Ukrainian tax dollars will go to cover the travel expenses of "friends of the government" who visit Europe, Canada, the USA, Australia, even Brazil ... ostensibly to network with the Ukrainian diaspora. I imagine few of those footing the bill consider there is much likelihood of many such “ambassadors” actually coming face-to-face with a "diasporan" in such places as Miami or the French Riviera. Meanwhile on the ground in Ukraine, I'm currently seeing first hand the conditions in which beleaguered taxpayers live, and the breathtaking incompetence of those in charge of collecting and spending their tax hryvias. So incompetent and indifferent are these stewards of the public purse that impoverished Ukrainians have to rely on foreign charities for a leg up and a shot at a decent standard of living. My host organization for this trip, HART (Humanitarian Aid Response Team out of Calgary), is quite unlike the elitist sycophants jetsetting and hobnobbing at the expense of hard-working Ukrainian citizens. I arrived in Lviv on July 18 and have already had several jaw-dropping experiences ... both good and bad, happy and sad. My host, Lloyd Cenaiko, the founder of HART keeps assuring me that I will have very many more during the rest of our time together here. HART supports local organizations (primarily evangelical churches) that set up soup kitchens for street children, summer camps for orphans, and programs for recovering alcoholics and drug addicts, hardened criminals, the handicapped, trafficked women, orphans, and other disadvantaged Ukrainians. Particularly astonishing is a hugely successful prison ministry run by evangelicals. As a result of their efforts, hundreds of hardened criminals are now leading normal, productive lives and contributing to the communities in which they live. They also built a playground and soccer field which is available to the greater community of some 20,000 people. It is the only recreational area for kids in the area. As in most Ukrainian cities, such civic services as parks are low on the priority list of city officials. Sadly, those willing to do the work encounter roadblock after roadblock set up by officials and the elites who influence them. After visiting Fimiam Church in Lutsk we dropped off Canadian volunteers from Three Hills, AB at a summer Bible camp a couple of hours past Lutsk. The camp was primitive but teeming with Ukrainian ingenuity! They set up sleeping tents and had a great eating/activity tent and the cooking tent was pretty skookum. To get to the camp, we drove on atrocious roads, and through a terribly poverty-stricken village inhabited by mostly alcoholic men and their wives and children struggling to make some kind of a life for themselves. The houses reminded me of my grandparents' old homestead khata I vaguely recall from my childhood days in Saskatchewan, after the spiders and mice had taken over residence. Very sad. Yet, interestingly, there were lovely flower gardens in just about every yard (planted of course by the women). And vegetable gardens, and lots of geese. A reflection, perhaps, of the enduring beauty of the Ukrainian soul struggling to survive against all odds. Today (Sunday) I was at an evangelical church that had been a TV factory in the soviet era. Ironically, it was a originally a church that the soviets trashed and converted to a factory that ran 24/7. 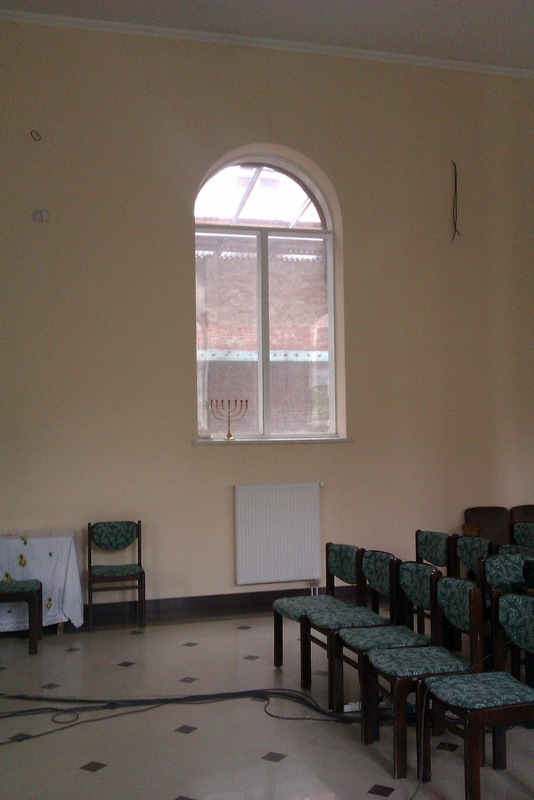 Miraculously, some lovely arched windows and a bit of stained glass survived the pillage. There is much renovation left to do and the congregation has a huge vision for social outreach. Another irony – most of the money comes from a Calgary church working with HART. 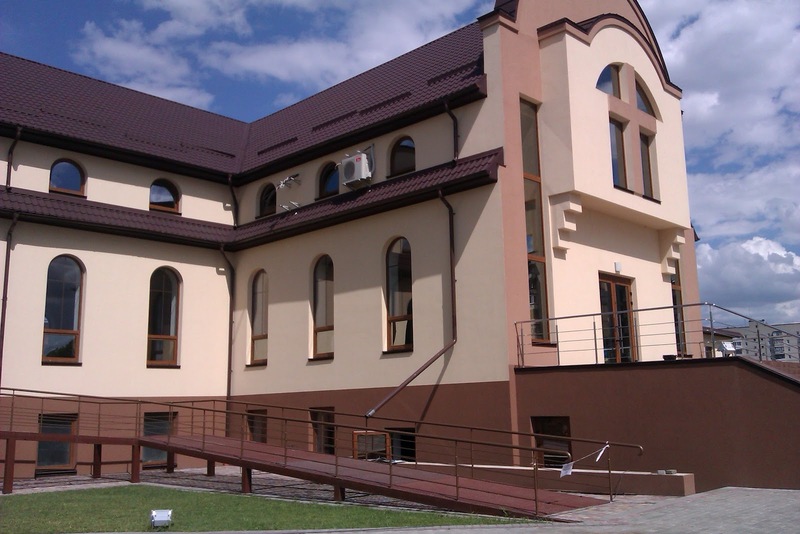 An evangelical church, that is - not a Ukrainian Catholic or Orthodox church. However a Ukrainian Catholic church in Calgary has expressed interest in working with HART, so hopefully that will change. There is a gargantuan amount of work to be done "in the trenches" to raise the standard of living in Ukraine to anything resembling what diasporans in the west take for granted. It is ironic, and sad, how much of it is being taken up by non-Ukrainians and people of Ukrainian descent (like the founder of HART) outside the established Ukrainian community. The saddest part is how many people in the diaspora wrap themselves in the Ukrainian flag and then go hobnobbing with the very political elites whose corruption they publicly decry. This trip, my third to Ukraine, is marked by a stark contrast between heartbreaking poverty and a shining hope for the future. HART invited me to Ukraine to see what they do on the ground here. I am particularly intrigued with their child sponsor program, one of the most successful to have been established. The cost to sponsor a child in Ukraine is $1 a day, which converts (at the current exchange rate) to about 8 hryvnias. The average salary of most families who are sponsored is about 300 hryvnias a month. I am asking Nash Holos listeners and other readers of this blog to consider sponsoring a Ukrainian child through HART. For less than the cost of a cup of coffee a day, a Canadian or American can almost double the household income of an impoverished Ukrainian family, and give a Ukrainian child not only the gift of practical necessities, but also of hope for the future. As Lloyd Cenaiko, the founder of HART, often points out, it is only by accident of birth that Canadians of Ukrainian descent are not experiencing the hardships and hopelessness that so many native Ukrainians do. Please join me in sponsoring a Ukrainian child, if for no other reason than to express gratitude for the good fortune to be born in a land of opportunity – and for having the opportunity to “give back” to our ancestral homeland. It's the least those of us in the diaspora can do. Plus, you can be assured that every cent of your donation will end up in the hands of those for whom it is intended ... and not the ruling elite and their friends. You can find a link to HART’s child sponsor program at the Nash Holos website. Next stop: somewhere in the Carpathian mountains. But, apparently, not everyone knows that! Recently I came across a recipe for borscht [sic], a traditional cold beet soup. It’s from The Book of Jewish Food by Claudia Roden, published by Alfred A. Knopf, Inc. 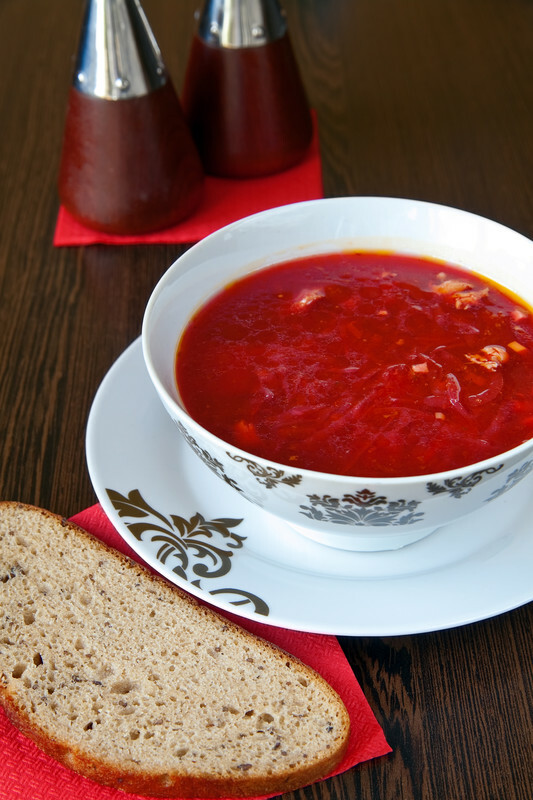 The author describes it as a cool sweet-and-sour soup which was particularly popular in Lithuania, and is now one of the great Jewish standbys of the restaurant trade. She does mention that there are lots of different Russian and Ukrainian versions of borsch (Ukrainians drop the "t"). Still, someone really should enlighten the author to the fact that it’s *our* soup. It even says so in Wikipedia! As the grandaughter and great-granddaughter of Ukrainian immigrants, I was raised on borsch. Different kinds ... meat, meatless, with cream, cream-less, rhubarb, potluck, you name it. 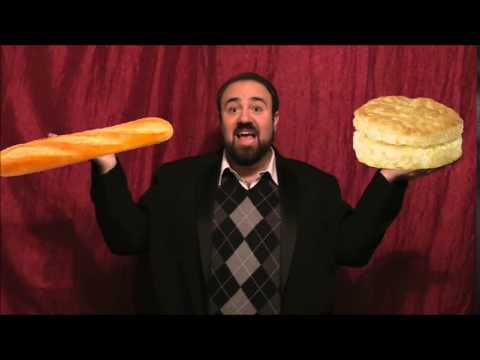 So I consider myself a bit of a connoissuer. And in my experience, borsch was always hot. The first time I learned there was such a thing as cold borsch was when I was a young adult, still (relatively) fresh off the farm and living in Winnipeg. I popped in to visit a new friend, who happened to be Jewish. 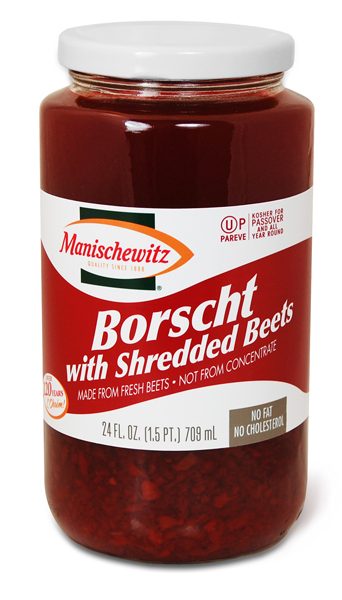 When I rang her doorbell, I caught her noshing on (of all things) cold borsch ... straight out of a Manischewitz jar! At the time what she was eating seemed as foreign to me as sashimi or goat curry (neither of which I’ve yet acquired a taste for). For one thing ... who ever heard of store-bought borsch? Never mind cold, but with nothing but beets and broth yet. Not a shred of cabbage or beans or potato to be seen. Let alone chopped dill! Besides, as far as I was concerned, the only kind of beets that came in a jar was the pickled kind. So ... cold borsch in a jar? That was just plain weird. As for the cold variety, Sylvia Pidraziuk Molnar recently shared her recipe for chilled borsch on Nash Holos. It is one of over 200 authentic Ukrainian recipes that Sylvia (a retired Vancouver cook and cooking instructor extraordinaire) has shared with Nash Holos listeners over the years. You can find the recipe here. Meanwhile, the Jewish version for cold borscht (borsch) that I came across is here. And if you'd like to check out the book, it's available on Amazon. Here's the info and title again: The Book of Jewish Food: An Odyssey from Samarkand to New York. Reading this article and the recipe brought back fond memories of my friend Marci, with whom I’ve unfortunately lost touch. If we ever manage to re-connect I certainly hope that, in addition to the memories and catch-up stories, we will share a bowl of borsch. Which version ... hot or cold, Jewish or Ukrainian ... well, only the future knows.